Bu yazıyı Türkçe okumak için tıklayınız. Located in downtown of the city and just a minute away from Dubai Mall, Burj Khalifa is one of the most visited and must-see places in Dubai. On its 163 floors are located offices, apartments and worldwide famous Armani Hotel. Dubai metro is fastest and most convenient type of transport in the city, thus metro station Dubai Mall/Burj Khalifa (Number 25) of red line will be perfect place to start your journey. 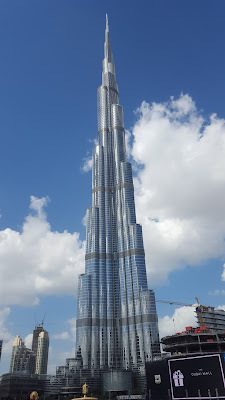 After metro, just take air-conditioned corridor to Dubai Mall (around 10 minutes walk) where you need to go to ground floor to the main entrance of Burj Khalifa. All visitors, who would like to visit the world's tallest building should buy ticket online or at ticket counter at the main entrance. We recommend you to buy your ticket online, as you will save up to 25% and will have opportunity to choose most convenient date and time of visit. 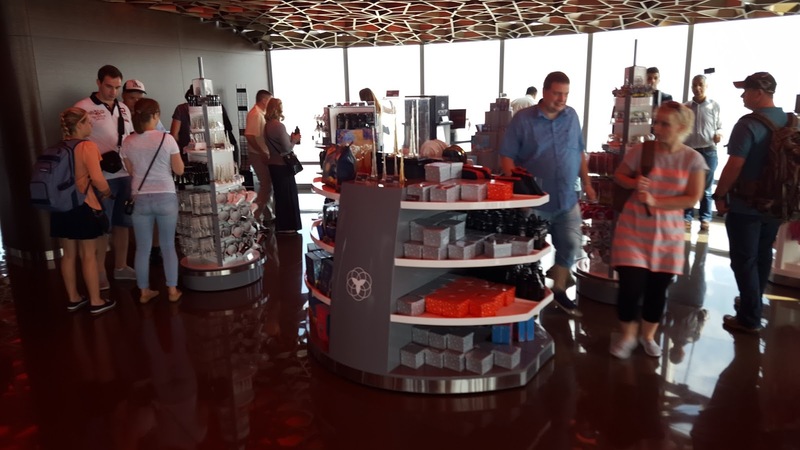 Due to high interest from tourists to visit the observation deck of Burj Khalifa named "At The Top", there are plenty of moments that all tickets are sold out for couple of upcoming days and ticket counters by main entrance of Burj Khalifa are closed. Buying your ticket online will give you discount as well as confirmed ticket in any available time and date for you. 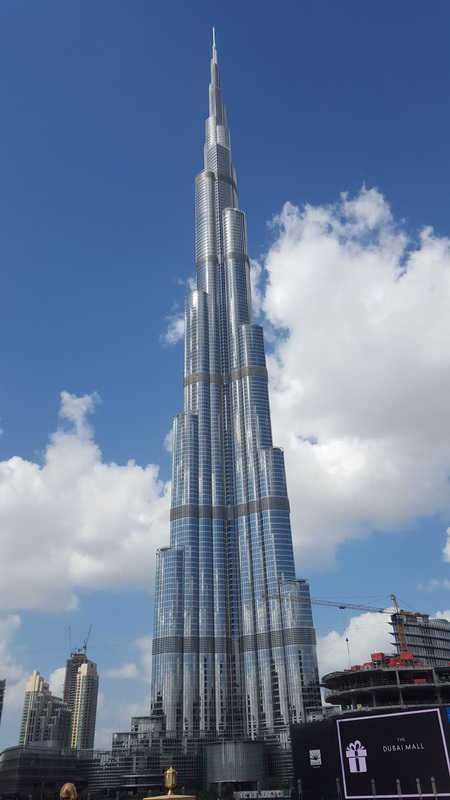 If you would like to visit "At The Top" of Burj Khalifa from 08:30AM- 15:30AM and from 18:30PM until closing, price of the ticket will be AED 125 net per person, and AED 95 per child for age from 4 until 12 years old. In case you prefer visiting the observation deck between 16:00PM and 18:00PM, the price of the ticket will be AED 200 net per person, and AED 160 per child for age from 4 until 12 years old. If you would like to experience having some tea or coffee with pastries on a great altitude- it will be possible to realize it as well. 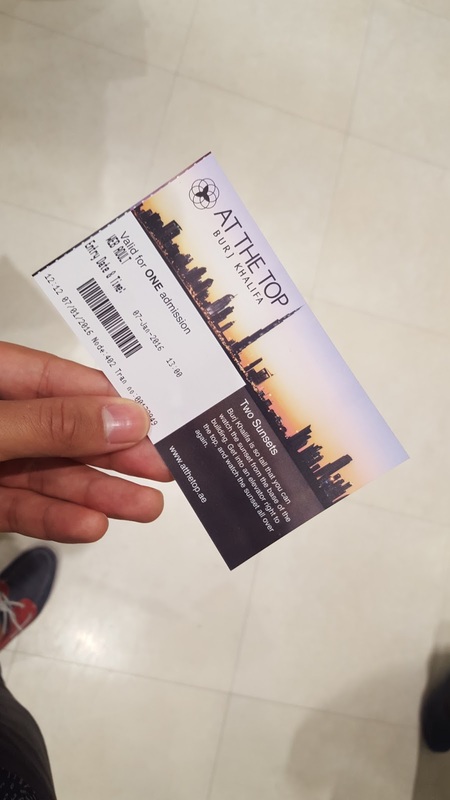 Although "At The Top" is located in 124th floor, visitors who choose option with refreshments during the online booking, will have access to Burj Khalifa SKY on 148th floor (555 meters). Guests of Burj Khalifa SKY can stay at level 148 for up to 30 minutes before continuing their journey to level 125 (452 meters), where they can stay as long as they prefer. The average time that you would spend to enjoy "At the Top" is approximately 1 hour and 30 minutes. Better to come 30 minutes before your confirmed time in the ticket due to security and ticket checks which can be, at times, very long. Visitors to 124th floor who wish to view the sunset can book ticket as well online. 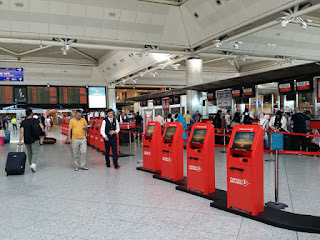 After passing security and ticket check, you will see different videos, pictures and other information showing how tower was built and how Dubai was before and now. After 90 seconds with speed elevator you will reach 124th floor of Burj Khalifa. 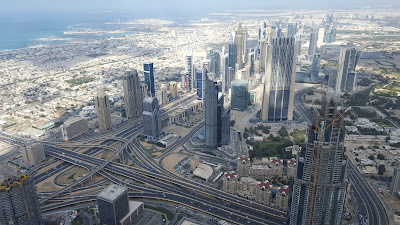 Passing by gift shop, you will see all city of Dubai (and even Sharjah emirate) from the top. If the sky is clear it's even possible to see coast of Iran. By the way, if you are looking for high quality gifts with unique design, we recommend spending at least 20 minutes in the gift shop where you can purchase creative gifts for your friends. Average price is AED 45 net per gift. 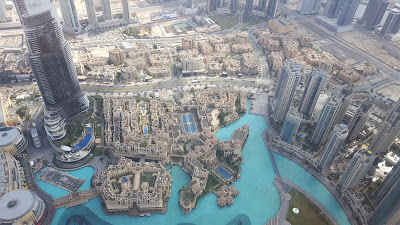 Jumeirah Beach, Deira, Dubai Airport, Dubai Marina, Sheikh Zayed Road, Dubai Mall, Dubai Fountain- everything can be easily observed from the top. Observation desk on 124th floor is indoors, however if you venture to climb to 125th floor by stairs, you will find brilliant outdoors observation desk, where you can feel even speed of the wind on 452 meters from the ground. Visiting one of the most iconic sightseeing of Dubai, UAE and of the world is a breath-taking experience. Surely it is a must-see place during your trip to Dubai. With affordable ticket price, you will see from the top one of the most expensive cities in the world, upcoming projects for EXPO 2020 and may be who knows- will find house of your dream? P.S. : Special thanks to M. Cherenko for this great post in English and Russian.